Outside our office, we have a single transformer that supplies about 3-4 different properties and we actually have an electrician who has spent most of his time adding additional grounding to keep our AC as clean as possible. The power goes off and on at least 3 times a week due to a silly overhead cable strategy from an indolent city council. Welcome to remote island living. Yup, electrical supply here is as dirty as can be, measuring anywhere from 195v to 230v (22v standard) depending on the load with storms creating surges and drops like you would not believe. To not have at least a line surge protector and AVR is irresponsible in these neck of the woods. But is it enough? When you have about 3-4 amps either side of a laptop and about 8-10 USB connections for DACs and a further array of IC’s to analog amps, noise becomes a serious factor. Anyone with a grounding hum in a complex setup will tell you it’s a nightmare trying to isolate noise from any one device and resolve it to produce a clean black background in its place. There are a lot of tools on the market now that claim to suppress noise well and increasingly they are making a mark in the personal audio market. 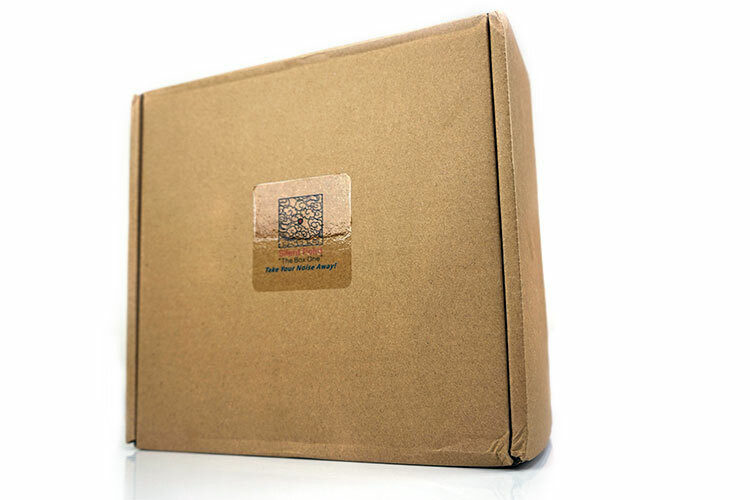 Several have arrived at our doorsteps in the last few months and the Silent Point Box One from Taiwan is one of them. It is also the prettiest of the arrivals, looking the least industrial of its clan. At $600 though I need to be convinced heavily that it can do the business and keep everything or anything quiet. Like all of these devices, both passive and active, the pitch is to improve the quality of the audio signal from your system to your headphone by suppressing background noise during playback via the Box One grounding box. 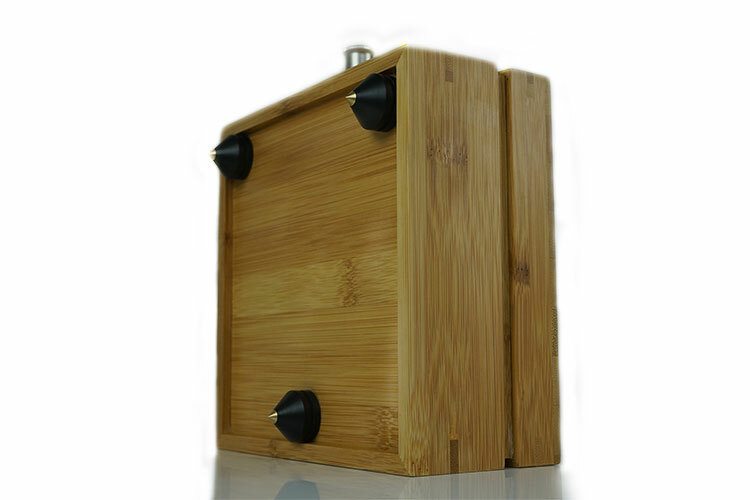 Basically, a grounding box will drain away strong magnetic fields generated by stray voltages by providing a solid grounding point for it to jump off your system instead of just circulating around your amp or DAC increasing the general noise levels. 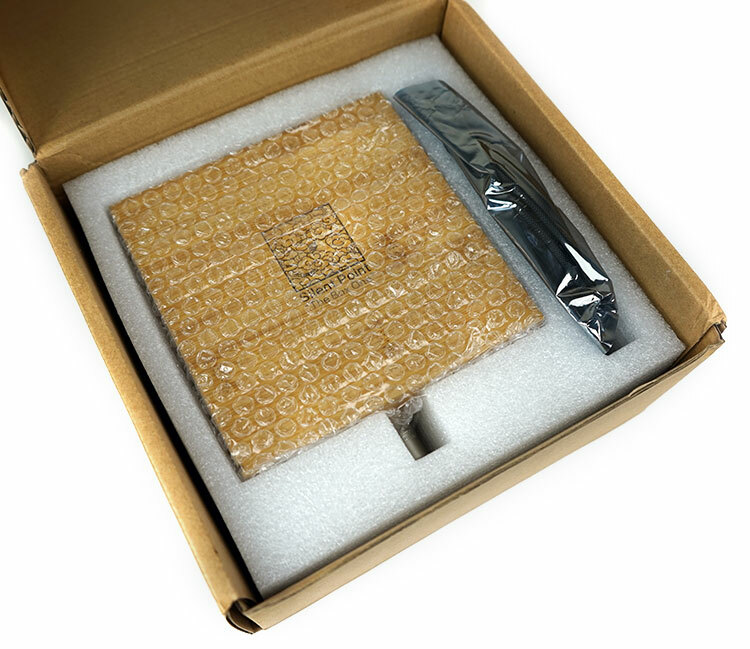 Silent Point has specifically targeted interference type noises with the Box One and these include, but not limited to, ESD (electrostatic discharge), Radio Frequency interference (RF), and EMI or electromagnetic interference. The idea being that the better the interruption and prevention of these types of noise then the lower the noise floor in our audible signal which will allow us to fully appreciate the nuanced aspects of an amp or DAC performance such as dynamic range (SNR) and any micro details that may have been hidden by noise. For instance, a ritardando along with diminuendo in classical passages where everything slows down and simultaneously gets quieter. Nothing worse than a little background noise to break the intended impact and clarity of the sequence when listening in the comfort of your own quiet home. What are we hoping for sound wise? Essentially a blacker background than before, more noticeable instrumental separation and generally an all-round improvement in staging qualities. This is not cheap at $600. Someone who is considering this will have a fairly high-end home entertainment, 2.1 or headphone desktop solution. Those who are considering this may have research other manufacturers such as Entreq and boy those things can reach out to $3000 and beyond for multiple point boxes. It is designed for those who want to get the very best out of their high-end system by completely eliminating the last pockets of noise resistance in one of their components. It is engineered for those who deem their power supply to be dirty, noisy and a hindrance to getting the best out of amps, DAC’s and receivers. This is a beautiful product to look at and yet at the same time, with its passive topology, a surprisingly simple design. There is no electricity flowing through the Box One, it does not need a power source to function. Thus, it has one binding post at the front and one only for connectivity. The rest of the Box One magic is sealed inside. On the outside, it’s a stunningly crafted light wood grain texture complete with knots and all the glorious imperfections, you get with wood designs. Yours will be different to mine, in fact, all will be unique since it is after all wood we are talking about. Each unit has the Silent Logo carved into the top of the wood. Whether machine stamped or carved by hand it is clean as a whistle in terms of finish. The wood itself has a varnished finish so it is not raw, it won’t crack in humid conditions. I have been testing it for a while now and I have yet to see a chip or flake fall off it. Silent Point themselves say the unit will have a useful life span of well over 5 years. The binding post is front and center and constructed of a fairly sturdy and thick aluminum alloy. There are some tiny grooves at the top and near the binding gap for additional grip when turning. The box measures 170 mm (L) x 170mm (W) x 82mm (h) (198mm (L) if you include the binding post). It is not that big in all fairness, about the size of a deep jewelry box. From the outside, the build comprises two parts, the main container for the topology and materials on the inside and a top lid which is sealed tightly with glue onto the bottom. The only interruption to an otherwise monolithic design is the wedge type seam running all around the box. I presume this is an accented flare to minimize any ugliness a plain seam between top and bottom would otherwise show. What will take you by surprise is the sheer weight of this otherwise small wooden box. At 3Kg (6.6lb) it takes a little bit of elbow grease to lift and move around. 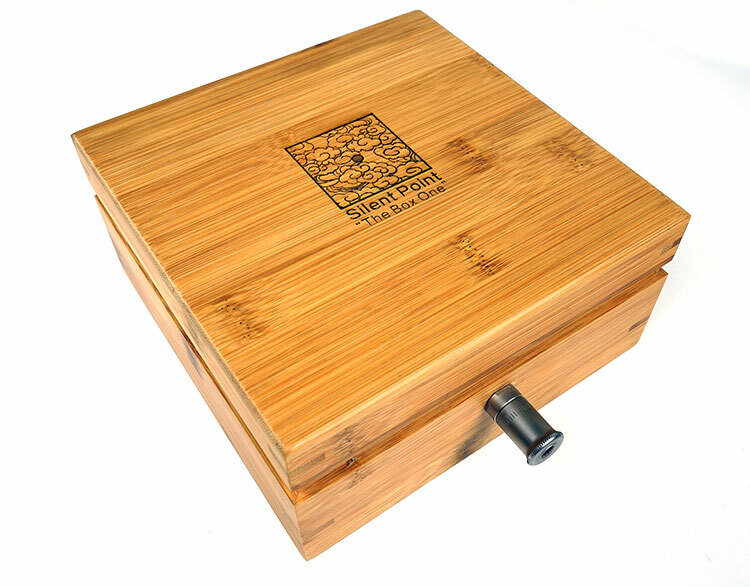 For those concerned that such a weighty and pretty box might take a hammering when placing on solid surfaces will be pleased to know Silent Point have provided a set of rubber feet as well as wooden spiked feet. The spiked feet provide a lovely accent and point of contrast to the boxes straight lines and give it some welcome height or a safe distance from the surface you intend to place it on. The rubber feet will do the same and maybe more useful if you are worried about the spikes denting your surface. There are 3 feet in total, both spike and flat so it’s a triangle formation using a set of 3m stickers on the underside of the box. Call me old school but I would have preferred four in an equidistant formation. My Rega turntable is a 3-pillar design also and it’s fine if unmoved but any slight imbalance when lifting it can cause it to tip to one side. Given the materials inside need to ‘settle’ for the Box One to work effectively, four feet rather than three might be a better catalyst for achieving a settled status. Inside the rather functional brown box, everything is neatly laid out with good packaging (and it would need to be at that weight) and padding. The feet and stickers are in their own plastic bags and alongside the Box One itself, you get an anti-static bag with two rather smartly finished silver IC cables. 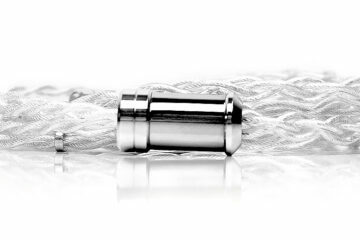 Both of these cables are constructed from pure silver with a fairly stiff but sturdy gray nylon weave jacket and measure 3ft long. They differ in terms of the connections and their applicable use. 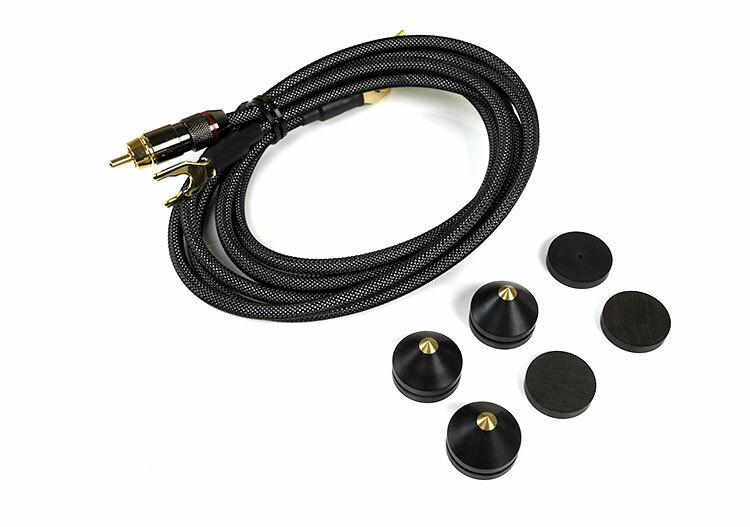 The first is terminated with a gold-plated spade-to-spade socket designed to screw into the binding post on the Box One and to one of the many grounding points on your AV, amp or speaker. 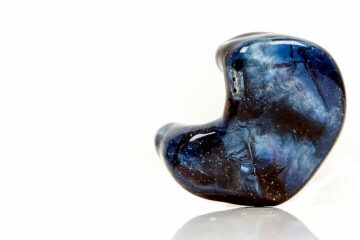 These can either be chassis screws, speaker negative binding posts, or dedicated ground point thumb screws. The second cable is likely to be the one for headphone users and their desktop solutions as it is fitted with a gold-plated spade-to-RCA male plug. Here you simply screw in the spade into the Box One as before and insert the RCA male plug of the cable into any spare RCA female socket on your desktop amp or DAC. In terms of placement of the Box One its really up to you but there are some basic parameters to get the best out of the unit in terms of performance. The first is to avoid high humidity and the second is to ensure the surface is flat so the internal materials settle before use. Second, if you are taking this out of the box right away from the delivery guy our suggestion is to wait about an hour after you install it before using it. Silent Point suggests giving it a little “pat” on the sides to settle the materials, which we infer to be a granular composition of some sort. Do this and wait an hour and you are good to go. Third, and perhaps the most logical, make sure it is within reach of the cables two connection points, the Box One itself and the grounding point you wish to connect to so anything within 3 feet will work. I have to be honest that my initial testing procedure and target units were a fail, much to Silent Points surprise. 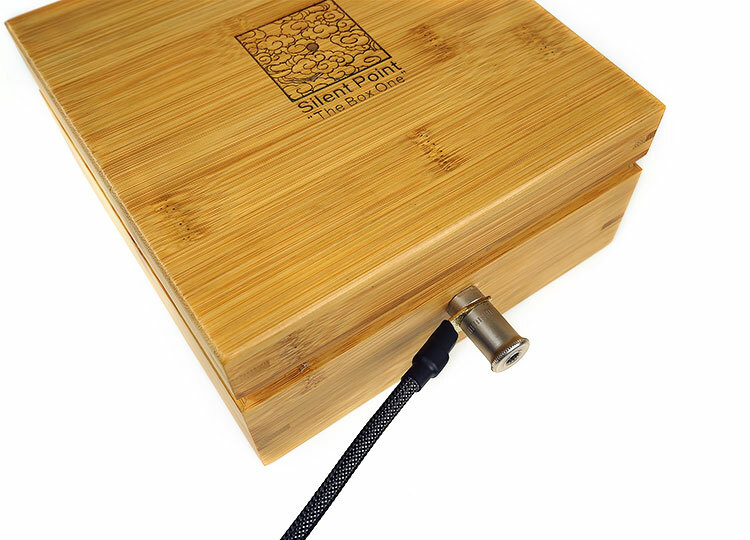 I think there were a number of issues though which required correction and it is useful, anecdotal it may be, to share this with those who are considering using a grounding box with their gear. First, if your target unit is already very well grounded and you are working a very finely conditioned and regulated power supply from the AC into a good modern headphone system the effects may be minimal. Second, if your external electrical supply, say from your transformer to wall socket is steady with minimal noise on the line (use an oscilloscope to check, I highly recommend some filtering at the AC) and all your switching chargers, power blocks etc are very well shielded or you simply are not sharing too many sockets then the benefit could be small. Third, you cannot test the Box One works through good old-fashioned A/B switching techniques because you will not notice the difference right away. The Box One needs time to properly drain away strong magnetic fields generated by those stray voltages. So, for example, connecting it to a target unit and then taking the connection off the Box One, checking the sound, then putting it back on the Box One and checking again will not generate anything significantly noticeable. The minimum connection time before analyzing the results I am informed is a minimum of 10 mins. The longer it stays on the target unit the better. The final caveat is the nature of the target unit itself. This maybe a sweeping generalization because ultimately it depends on how each device is really engineered but the best results I found with the Box One were on source devices such as DACs, Cassette Decks, CD players and turntables. Amps generally amplify the generated source noise so the Box One will be more applicable at the root point on a ground screw or an RCA out. For me my best results with the Box One were on my old Nakamichi DR-3 and my Rega turntable which uses a Pro-Ject Phono Box S via RCA out and then into a tube amp via RCA in. These were my noisiest devices and my most analog. You may have digital DACs that work better, or you may have the same experience as me with analog devices. Ultimately it just comes down to how well or poorly the target device is shielded or grounded against EMI and other noise generating waves. For analog testing, I wasn’t expecting Dolby Logic levels of filtering on the DR-3. Besides I hate the way Dolby NR kills the top end and lays a pillow over everything to suppress tape noise on the Nakamichi so I normally leave it off meaning I get the full spectrum of noise. I also tested with both the Aux out Oppo’s Sonica DAC and then out to the Cayin iHA-6 as well as the direct out from the jack on the DR-3. The jack is fixed level output but not that high so fairly easy to listen to. To get volume control you need to channel it to a dedicated headphone amp hence the Cayin route. The Cayin definitely served the better presentation with the jack out of the DR-3 just that bit grainier sounding with a more metallic overtone whereas the Cayin/Sonica route was a little more refined. In comes the Box One. Now this is not a Dolby NR replacement, all the usual tape noise will still be there but what you do get is a touch more clarity and detail shining through. After leaving the Box One on a spare RCA output for a few hours I threw on my 1995 Radiohead The Bends cassette. Now this is probably the cleanest I have heard it in a while subtle as the change may have been. Having played this cassette for around 22 years I tend to pick up nuanced changes quickly. Staging wise it where I noticed the most in terms of changes. There was a slight improvement in the clarity of the imaging aided by a slightly better instrumental separation and a quieter background during playback. Tambourine accompaniment on tracks like “Sulk” rang loud and clear, guitar plucks on Street Spirits Intro were accurate rather than smeared sounding. For vocals I preferred the Cayin iHA-6 via the Sonica DAC over the DR-3’s own jack. They simply sounded more refined and less prone to sibilance with a proper amp. This is the natural home for the Box One and a more convincing improvement than the DR-3 pairing. The grounding cable used was spade-to-spade to a Pro-Ject Debut Phono stage and out to the Studio 6 tube amp. The RP1 uses a grounding through the tone arm out, some have reported hum and a lot of interference during playback. Not that I have had this kind of serious problem with my own setup but with the Box One attached I got a superior black background than before, a noise free experience and a really enjoyable analog presentation. I got the odd piece of static as any turntable owner will have from time to time but otherwise no complaints here. Test tracks from Christopher Cross’s The Cafe Carlyle Sessions sounded excellent with plenty of detail and an authentic enticing timbre. This is where I think the Box One really belongs. More so than my DR-3 where the results were good but not as satisfying as a turntable pairing. $600 is a lot of money to throw down for this type of device if you have not properly assessed your own setup first for noise both source and target unit based. This is something I strongly urge you to think about before buying the Box One. My own experience is purely anecdotal, it took a lot of trial and error before I found the best matches. Coming from a headphone background I cannot tell you if a fully-fledged speaker system will be the right home because again you have to assess how everything it setup to begin with. Are you experiencing EMI, RF or just generally annoying noise? Then, by all means, try it. Are you an analog system user? I suspect this is where the best results are based on my own experience. Do you have basic power boards and plug into an AC without conditioners or AVR? You could benefit from a good grounding solution. The value ratio makes its own “noise” on large-scale systems. If you are rocking a $500 headphone amp and using a DAP for a source then honestly the value proposition is too high. If you have a few power amps, top of the line direct drive turntable/phono stage and say a few electrostatic or horn speakers in the room then it starts to make sense. People pay a lot to get the right sound from speaker systems and if I can hear some of the benefits on a regular TT with a $4000 amp then I suspect those guys will lap this one up.